Melanie Greenwood has been a freelance writer since 2010. Her work has appeared in "The Denver Post" as well as various online publications. She resides in northern Colorado and she works helping to care for elderly and at-risk individuals. Greenwood holds a Bachelor of Arts in pastoral leadership from Bethany University in California. 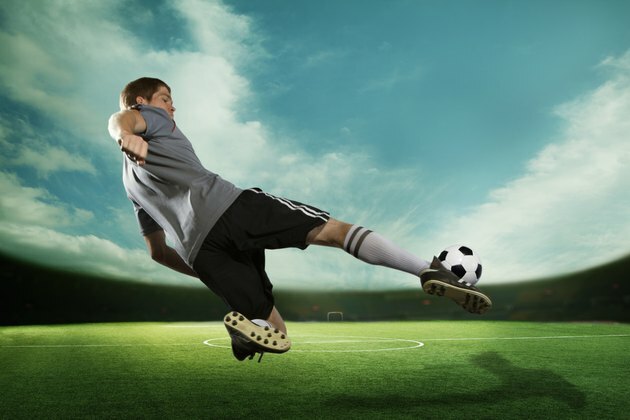 Soccer, or football as it is known in most of the world, is without question the world's most popular sport. More people are involved with soccer, as players or spectators, than any other sport. However, to ensure a fair match, soccer balls must conform to certain standards. FIFA, The Fédération Internationale de Football Association, the organization behind the World Cup, soccer's highest-level championship, is responsible for regulating the balls used in the game. According to the FIFA website, only balls that meet FIFA's stringent requirements are allowed in the all FIFA-overseen soccer matches, such as the games comprising the World Cup. FIFA-approved soccer balls come in two sizes, size 4 and size 5, according to FIFA's specification chart. Players older than 12 years of age use size 5 balls, while players aged 8 to 12 years use size 4 balls, according to Soccer Ball World. FIFA regulations state size 5 balls must weigh between 420 g and 450 g, while size 4 balls must weigh between 350 g and 390 g.
A properly weighted ball ensures a fair and enjoyable match. The average kicked speed of a 230 g soccer ball is about 25 meters per second, according to The Physics Factbook. Players accustomed to this speed, and accustomed to adjusting their kick force to account for it, would not be able to score goals as easily using a lighter or heavier ball. Multiple factors influence ball weight, which is why FIFA has established regulations governing them. For example, FIFA regulates air pressure, the amount of air pressure balls are allowed to lose during play, and even how much water a ball may absorb during play. Size 4 and 5 balls must be pressurized to 0.8 bar, may not lose more than 20 percent of their air pressure and may absorb no more than 25 percent of their weight in water. What Is the Weight of a Size 5 Soccer Ball? Does Air Pressure Affect the Bounce of a Basketball? What Is the Official Size of the NFL Football? How Much Air Pressure Is in a Regulation Size Soccer Ball?